With red yarn, sc around the entire perimeter of the square. Then fold three corners to the center of the square, creating an envelope. Use needle and thread to stitch each seam together. Add a love note and you’re finished! This entry was posted on Thursday, January 19th, 2012 at 11:46 AM by Emilee Gettle	and is filed under Free Crochet Patterns. You can follow any responses to this entry through the RSS 2.0 feed. You can leave a response, or trackback from your own site. So innnovative! I had some white 4ply and pink 4ply hanging around. I started this about twenty minutes ago (1:20 am) and I have just finished! Super cute! Mom’s birthday is Valentines Day and this is perfect! 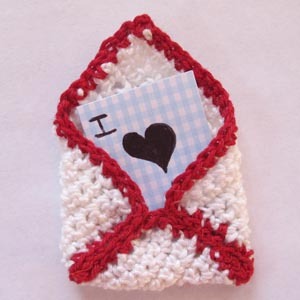 This would make a really sweet tea-bag cozy….love it! Thanks again Emilee! Nice work!! My Mom’s birthday is also Valentine’s Day. I am always on the lookout for cute Valentiney things that I think she would like. This is so cute and is a good pick me up as she just had hip replacement surgery and needs some cheering up. LOVE this crochet pattern and the tea bag cozy is a great idea. Thank you for your site> I’ve wanted to learn how to crochet for a long time but always got stuck not having a clue what I’m meant to do. How that I have a idea I can”t wait to start. Buying wool seem to not be so easy where I live in South Africa. I’ve heard it will come in with Easter. So for now I’m just practising. I love this little pouch! Thanks so much for sharing! I’d like to include a link to your website and one photo in a Valentines Day crochet pattern roundup if that’s alright with you. It will be posted later this week on candleinthenight.com. Thanks so much!